Cholangiocarcinoma is more commonly known as bile duct cancer and is often referred to being a silent disease as symptoms may go unnoticed until the cancer is already in an advanced stage. Patients may often present early signs and symptoms of Cholangiocarcinoma however in many cases they are attributed to another disease. When the disease is found in an early stage, surgical intervention can provide the best treatment results. As a result of cholangiocarcinoma being diagnosed after it is already in an advanced stage and has already spread, surgical intervention is often not an option. Cholangiocarcinoma starts in the bile duct, a thin tube about 4 to 5 inches long, which allows fluids from the liver (bile) to drain into the upper portion of the small intestine (duodenum). 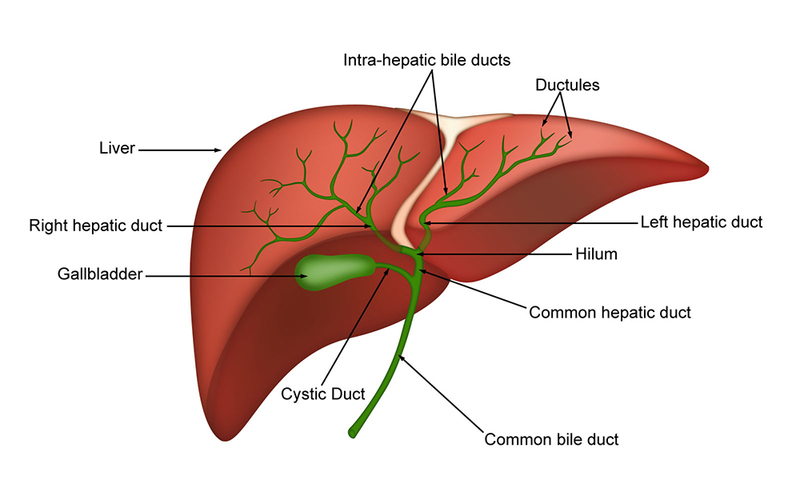 The bile duct system consists of the gallbladder (a small organ that stores bile) and several small tubes (ductules), different parts of the system have different names which together are formally known as the biliary system. In the liver it begins as many ductules where bile collects from the liver cells. The ductules come together to form small ducts, which then merge into larger ducts and eventually the left and right hepatic ducts. The ducts within the liver are called intrahepatic bile ducts. These ducts exit from the liver and join to form the common hepatic duct at the hilum. About one-third of the way along the length of the bile duct, the gallbladder attaches by a small duct called the cystic duct. The combined duct is called the common bile duct. The common bile duct empties into the the duodenum at the first part of the small intestine. These cancers develop in the smaller bile duct branches inside the liver. They can sometimes be confused with cancers that start in the liver cells. These cancers develop outside the liver where the right and left hepatic ducts have joined and are leaving the liver. 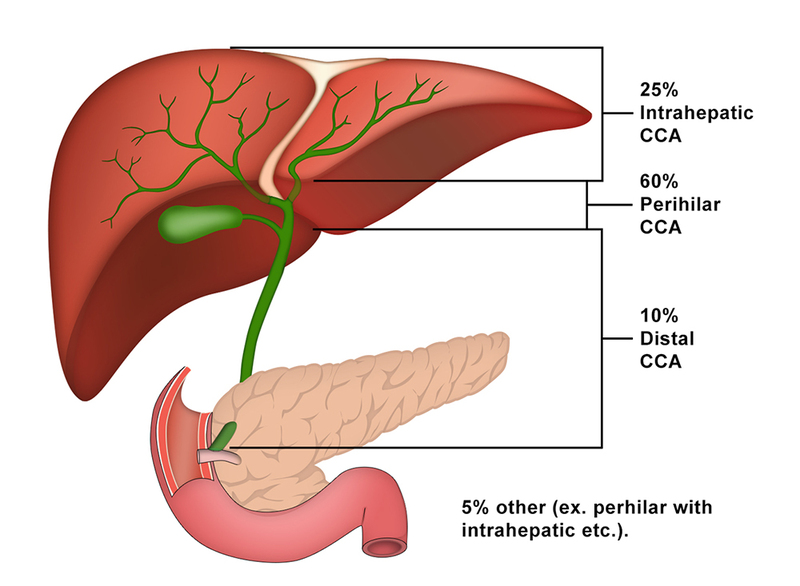 These are the most common type of cholangiocarcinoma accounting for the largest percentage of all bile duct cancers. Distal bile duct cancers develop outside the liver and are found further down the bile duct closer to the duodenum. Because perihilar and distal bile duct cancers develop outside of the liver (extrahepatic), they are often grouped together and referred to as extrahepatic cholangiocarcinoma. Cholangiocarcinoma can also be divided into types based on how the cancer cells look under the microscope. Adenocarcinomas are cancers of glandular cells that can develop in several organs of the body. Bile duct adenocarcinomas develop from the mucous glands that line the inside of the duct. Advances in the Diagnosis of Human Opisthorchiasis: Development of Opisthorchis viverrini Antigen Detection in Urine Chanika Worasith, Christine Kamamia, Anna Yakovleva, Kunyarat Duenngai4 , Chompunoot Wangboon, Jiraporn Sithithaworn, Nattaya Watwiengkam, Nisana Namwat, Anchalee Techasen, Watcharin Loilome, Puangrat Yongvanit2, Alex Loukas9 , Paiboon Sithithaworn, Jeffrey M. Bethony. cancer.gov/cancertopics/pdq/treatment/bileduct/HealthProfessional on September 17, 2014.
nccn.org/professionals/physician_gls/pdf/hepatobiliary.pdf on September 17, 2014.